Bioware's upcoming Dragon Age game has been in pre-production longer than Origins, Dragon Age 2, or Mass Effect. It's been almost a year and a half since BioWare accidentally revealed that it was working on a new game in the Dragon Age series. When it comes to what the game will actually contain however, BioWare's lips are tightly sealed. The only substantial information we have is the Inquisition subtitle and that it will be set in Orlais, along with the usual promise that DA3 will be bigger and better than the originals. BioWare isn't planning to reveal any specifics just yet, but one very interesting detail has slipped out: in terms of pure pre-production time, Dragon Age 3 rivals most of what the developer has made in recent years. The information was revealed at the Comic & Entertainment Expo in Edmonton, where BioWare producer Cameron Lee tweeted the key points of a Dragon Age Look Ahead panel. "[Lead Cinematic Designer] Jon Perry said he's had a longer pre-production on DA3 than any other BioWare project he's worked on," Lee wrote. "JP said just one level in DA3 is as big as all of DA2's levels." The panel also stated that the game will include more customization options than DA:0, including the ability to dye the color of your armor. BioWare'sMike Laidlaw also presented a picture of a huge castle fortress, joking that the player "may or may not take control of it". 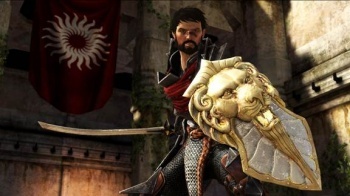 In and of itself, Dragon Age 3 having a long pre-production time might not mean anything for the finished product. BioWare likely pushed back DA3's release date to work on Star Wars: The Old Republic, which could explain the lengthy development period. Still, BioWare has also claimed that Dragon Age 3 will combine the best elements of DA:O and DA2, which might herald a return to the larger scope of the original title. Perry's claim that a single DA3 level encompasses all of DA2 certainly lends weight to that theory. All of this is simply speculation until we actually see the game itself, of course. Considering that many Dragon Age 3's development team have been with the franchise from the start however, I am choosing to be cautiously optimistic.